Looking back, this has to be one of my longest weeks. It started with the holiday last Monday and the suspension of work on Tuesday. The weather disturbance gave me more time to accomplish my teaching tasks. Despite having enough rest and sleep, I was struggling for productivity when I returned for work. In the middle of everything, I had my own share of sad and distressing encounters. One was the melancholic yet meaningful dialogue with a colleague. I almost ended with another crying episode. On a positive note, it always feels great to share grown up sentiments with an equally burdened person. Before the week ended, an inconsiderate member of the male populace played an offensive joke on me. I was placed on a pathetic trap, designed to contribute to his selfish empowerment. He probably aims for an egocentric story to brag among his friends. It felt no different with rude men who took advantage of helpless females inside public transports. It feels even worse because I knew the person and assumed that we respect each other. I held on to my composure and made all means to escape that disrespecting conversation. While I can't prevent situations like this to happen again, the least I did is to discretely eliminate all possible connections with this person. Default photo of the week : weekly planner mess - We are nearing the last months of the year which also means, I'm about to finish an entire planner. I will surely reread all entries before the year ends. I'm also in search for my 2018 planner. I'm eyeing this floral planner from Kate Spade. I hope National Bookstore will carry it for a reasonable price. But with how the US $- Php exchange rate is going, it will surely be overpriced. I'm typing this post on a quiet and relaxing Sunday night. The rare times I feel relaxed because of the holiday break. I don't feel the rush and usual frustration that weekends are over. I still have some work to do but from the looks of my tired and lazy self, everything has to be set aside. I long to sleep before 12 am, wake up before sunrise and accomplish all the tasks in my list tomorrow. Before the week ended, I attended an important event. There was an advice to come in business attire. I skipped my usual Friday jeans and sneakers. I wore slacks, short sleeved top and my favorite pair of ballet flats. When I arrived in the venue, I felt out of place. I should know better. I should have taken the business attire seriously. This also reminded me of the usual advice, it's always better to be overdressed. Later that night, I realized that I don't have a set of formal clothes to begin with. I have plenty of clothes, but none would qualify for formal events. Same goes with my bags, I don't have a clutch or any formal bag. This only proves, I keep on buying the same items. At this age, I should have my own pieces for formal events. During the weekend, I had another weird wedding dream again. Oftentimes, the wedding had no groom and the ceremonies will not push through. For several years, I thought it meant as a prelude to my future. No groom, hello to single blessedness forever. Hahaha However, some reliable materials gave me deeper meanings. Weddings may symbolize change, independence and commitment. Some even connected it with sorrow, agony and bitterness. With my current state, I would like to believe that it relates with bitterness. I remember discussing an issue with my mother a few days ago. It really frustrates me how some people can resort to cheating and commit other wrong doings in exchange for promotion, advancement and other forms of progress. Aside from promoting a culture of inequality, these people demoralize those who adhere to full honesty and hardwork. On a positive note, I realized that honest and hard working people will always have priceless respect and value. Something that those who cheated will never achieve. Whenever, I feel hopeless I guess I have to rely on this thought. Weekly Planner Mess - Despite all the frustrations, I was reminded of some good things that happened last week. The review may appear biased because I knew the team behind this short film. They were former students who graduated a few months ago. A school project that landed on the stage of Cinemalaya is already remarkable. However, the achievement went beyond expectations. It won Cinemalaya's Audience Choice for short feature film. Hats off to Nicholle, Sean, Martin, Jaynus and the entire team!!! Nakauwi na deals with a social and political issue that has become a constant content of the local news, EJK or extra judicial killings. 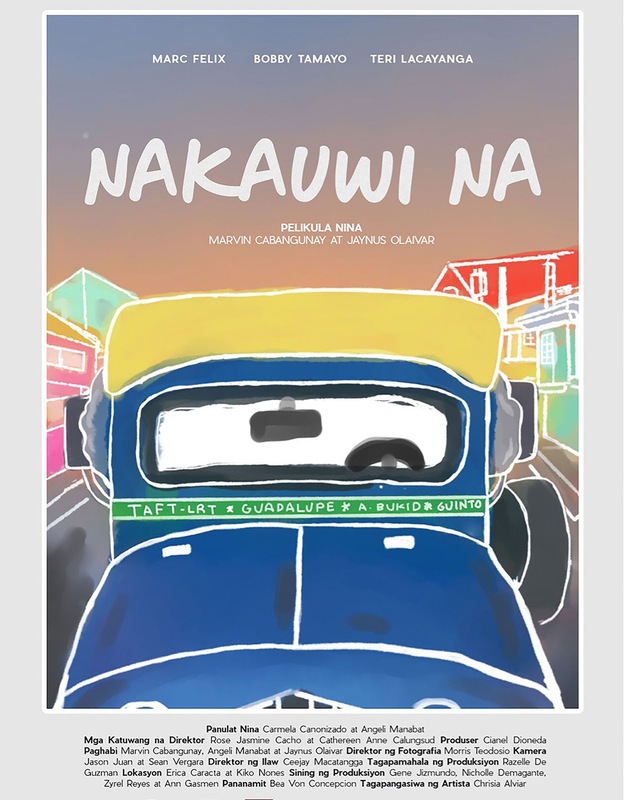 Nakauwi na focuses on the untouched side of EJK. If there is anything that remains unadulterated about EJKs, it's the concealed stories of families behind each death statistic. Father and son, Mang Jerry and Emman, depicts the life of a typical Filipino family. Mang Jerry is a struggling yet optimistic jeepney driver, who wanted nothing but for Emman to finish his studies. Emman is the dutiful son about to finish his degree in Engineering. A few days before Emman's graduation, Mang Jerry woke up to the worst nightmare for any parent. Emman's lifeless body was plastered, disgraced and labeled with the usual accusation in those summary killings. The film highlighted the reality that most victims of EJKs came from poverty stricken families. It's almost tantamount to saying that poverty begets EJK. Another eye opener was how poverty and EJK can deny anyone even with the least respect. Surviving families cannot even mourn because of financial burdens, legal concerns arising from a crooked justice system that favors those with resources and connections, and the depressing reality that even your remaining support system (friends and relatives) will eventually close their doors. All these happened to Mang Jerry. Despite all the inhumanity, Mang Jerry, who has all the right to blame the system, remained meek and honest. He resorted on pitiful measures just to give that decent send off for his lone son. In the end, he stood up and fulfilled that one last mission. The scene was painful yet heart warming, heroic and dignifying. The short film is overflowing with themes and sentiments, setting aside the ruthlessness of EJK. The film also emphasized that Mang Jerry and Emman's story represents only one of the thousands in the growing list of death figures. The film does not aim to end all the summary killings or aggravate the hate to the people behind this injustice. There were compelling scenes that challenged viewers to rethink or change their perceptions. A significant part of the film relates that while we condemn all forms of social injustices, we have unconsciously become its silent contributors. 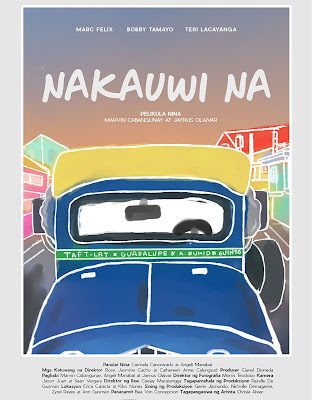 No doubt, 5 out of 5 stars for Nakauwi Na. I started writing this post in the middle of the week. I already have a theme and direction for the content. The earthquake last Friday changed everything. A few hours after lunch, I felt unusual swings in my work cubicle. I thought I was just feeling dizzy and light headed. It always happens because I rarely get enough sleep. When everyone was already reacting, we left and moved to the school's open ground. Prayers were uttered and soon enough, everything felt stable again. It was quite a relief. Some things I learned after, I'm thankful that I don't stay in a high rise building. The school's open grounds provide more than enough safety space for everyone. Work life went on. I even attended to my Friday night classes. Going home was stress free, traffic was nowhere. Though honestly, I was exhausted. Aside from the threatening incident, I was plagued by grown up concerns. I'm making plans, one of which already materialized. I'm hoping for positive responses. In between, part of me feels frightened. I can only wish a great blessing will come my way and in a snap, all my worries will go away. But life works on a different way. Oftentimes, it leads to the most difficult and painful pathway. I sound so disheartening. It feels like I see life with nothing but sorrow and agony. I attribute everything to my old and usual habit of excessive worrying. Despite these heavy life concerns, some light, happy and heart warming moments still come my way. The highlight of the past week was the visit to Chinatown (Binondo) with my cousins. After attending to some errands, they treated me to a bowl of hand pulled noodles and a lot of dimsum. Nothing beats authentic Chinese food. It also feels great that one of my longest running projects at work is finally done. Weekly Planner Mess - I noticed, my planner reflects my prevalent sentiment. I tend to generate dark and less colorful output when I'm consumed by sad sentiments. I'm loving this designing eyebrow pencil from The Face Shop. A few weeks ago, I dropped by The Face Shop to purchase my usual eyebrow pencil. I was disappointed when the sales assistant told me it's out of stock. In return, she offered the designing eyebrow pencil. I was reluctant because it's expensive, not until I learned it was 50% off its original price. Added to this, the store is hosting a buy one take one promo. Deal!!! These items originally retail from Php 399 to 495. I've been using the pencils for weeks.Much to my surprise, they didn't disappoint. Though it's quite tricky to use, the pigmentation and pencil's versatile tip create the best eyebrows. My fascination with postcards intensified when I started my own postcard challenge. I challenged myself to send at least one postcard to a friend every month. The task was easy, the real challenge was finding a constant supply of quality postcards. I was fully aware of the scarcity of postcards in the local market. Shops like Papemelroti, Hub Make Lab in Escolta, and the on and off vintage shop in Sta. Cruz Manila gave me great selections. Problem is, new designs don't often arrive. I already sent all the designs to my friends, long before another series is released. In the end, I'm always in search for shops that offer beautiful and reasonably priced postcards. Once in a while, I settle for independent sellers in Instagram. Etsy and Society 6 make another great source, but shipping fees often exceed the price of the postcards. On a few times, some local artists email me for possible collaboration. Unfortunately, none of these offers materialized. A few weeks ago, I received a message from the team behind Inspiredby.Ph. I was surprised that there is at least one company, who takes postcard production seriously. Aside from their in-house design, the company collaborates with local artists in promoting the Philippines through postcards. I always admire businesses that provides opportunities for local talents to showcase their artistry. But what further caught my attention, the company is owned by real life couple who are not Filipinos. Soulmates, Jane and Max are originally from Russia, but found home here in the Philippines. They are currently based in Dumaguete and manages their own business. Creating postcards is just one of their ventures. I'm hoping there are other postcard enthusiasts reading this post. You will surely love their designs. I appreciate businesses who takes packaging as a serious business. All items ordered online will come in this beautiful box. Happy Mail - Thank you Terra and Marieken for the postcards. One reason that relieves me after a long day at work. Some goodies from the mail - Last week, the team behind Inspiredby.Ph reached out to me. Just when I thought that finding beautiful postcards in the Philippines is a challenge, I discovered an independent local shop that produces unique and beautiful postcards. I will blog about my postcard loot soon. Wishing everyone a great week ahead!